I may have mentioned once, here, that I enjoy making New Traditions. As witnessed in my blog post -- To Have or Have Not﻿. 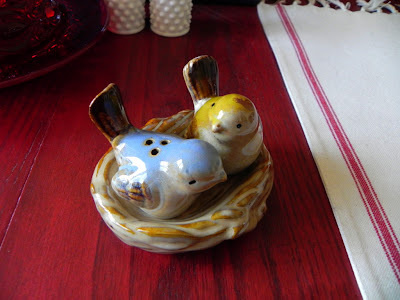 Well, I got this crazy idea in my noggin that I want a pair of Special Salt & Pepper Shakers for each and every month and only set out for that one month. Odd? Yes. Totally Me? Hell yes. I only have six pair thus far... I'm hunting down some more. I'll have to get out April's on Friday.